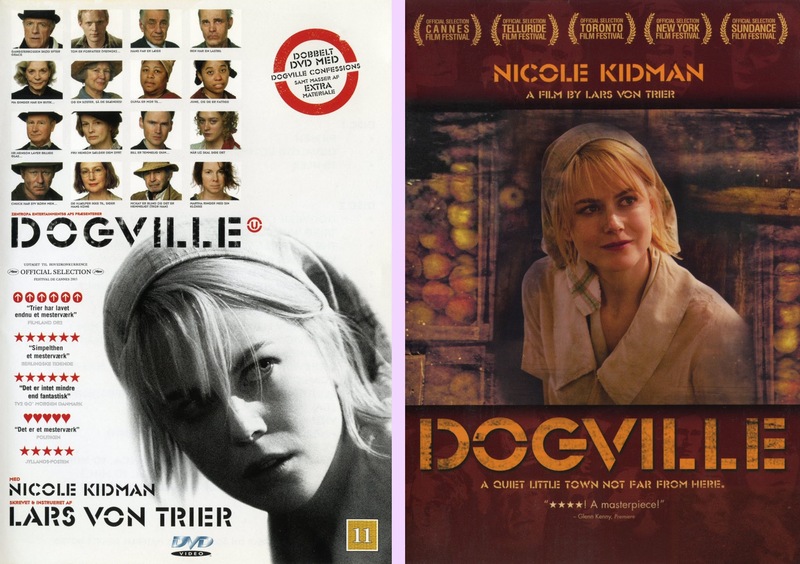 In 2003, Lars von Trier's latest film, Dogville, was released in theaters and later DVD. Except in the USA, where it didn't arrive until late 2004. But hey, it was worth the wait, because that time allowed the studio to gather... fewer extras? A lot fewer? What label put this... oh. Lions Gate. Well, it's Trier, so thankfully there's always a Nordisk option! a telltale shot from the Nordisk extras. 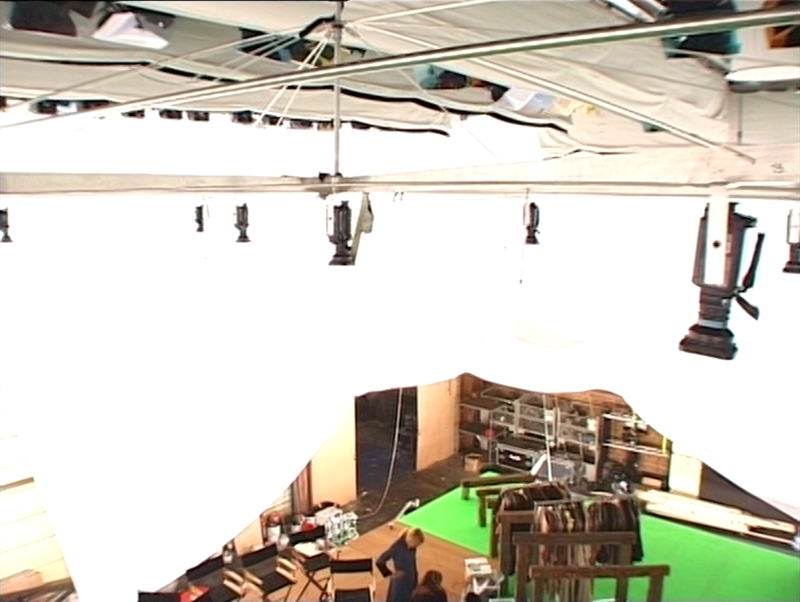 Dogville is often misidentified as being another of Trier's Dogme95 films, meaning one of the films that adheres to the coda to not use opticals, un-synced sound, artificial lighting, camera mounts, props that didn't originate on the filming location, etc. You can read the complete "vow of chastity" here. That's because this film has a unique, minimalist style where all of the drama takes place on a single stage with the locations simply written in what looks like chalk. But this film's actually about as far in opposition to the dogme rules as you can get. 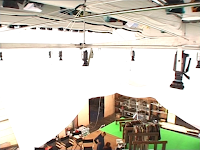 It's a highly technical film shot with an elaborate rig of 156 cameras mounted to the ceiling of a fully green-screened soundstage, cameras on cranes, CGI, sound effects, masterfully artificial light, etc. It's got to be the most artificial film to establish the fact that artifice isn't necessary to make a compelling film. Nicole Kidman has the showy lead, but the drama's really elevated by the incredible ensemble cast, including Lauren Bacall, Stellan Skarsgard, Paul Bettany, Ben Gazzara, James Caan, Bergman regular Harriet Andersson, Chloe Sevigny, Jeremy Davies, John Hurt as the narrator and everybody's favorite: Udo Kier. Who needs fancy backdrops when these guys are on screen? It's one hell of a gripping story about the residents of a small town who wind up with far too much power over an individual person, Kidman, who's on the run from mobsters and relying on them to keep her hidden. It's written by Trier, so as you can imagine, the psychology veers into some very dark and surprisingly honest territory. Roger Ebert famously accused this film of being anti-American, as it's Trier's first film set here and the characters get pretty unlikable, but I find it very in keeping with the kinds of stories he regularly tells set everywhere else; and I the fact that he took it so personally really got in the way of appreciating what he was seeing. In fact, frankly, I think his review's rather silly. I know the anti-American reputation spread a lot further than that one review, but I'd really encourage my fellow countrymen not to let that reactionary stance put you off seeing this film for yourself. So, I went with the Nordisk 2-disc set straight from Denmark, but this film was released in plenty of countries, and they almost all far outshine the US DVD from Lions Gate. Korea, France, Holland... 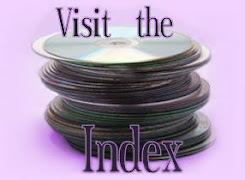 Although looking it up on dvdcompare just now, it seems the UK disc came up quite short, too. Even the 2010 re-release comes up just as light. So Brits, you're going to have to import, too, I'm afraid. 2004 Lions Gate DVD on top; 2003 Nordisk DVD beneath. ...And we see that so much of that extra crispness is edge enhancement halos and artifacting. It looks like Nordisk created the haloing by trying to sharpen the image, whereas Lions Gate when the opposite direction and smoothed away all the compression smudging, giving us a softer image (and it still has the haloing, it's just subtler). But then, there's not much genuine detail that we're losing. 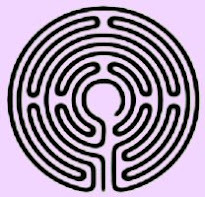 I think we see her left eye clearer, for example, in the Nordisk image; but most of the extra detail is just digital noise. They're different, but it's hard to pick a winner; they both limp slowly to the finish line for different reasons. Personally, I think I prefer the Nordisk for being crisper and more defined, but really it's just down to picking which flaw bugs you the least. Clearly, this film is in need of a nice, new HD master. But there is no blu-ray or anything of this film. This is all we've got. And they're both... fine by DVD standards. Both discs offer 5.1 mixes, but the Nordisk also has a 2.0 stereo track, and it has a French 5.1 mix besides. The US disc has English and Spanish subs, while Nordisk has English, French and Danish subs. To be clear, though, the film and almost all the extras on both discs are spoken in English. And the non-English bits in the extras are subtitled, so it's 100% English friendly. Don't let the foreign packaging put you off. 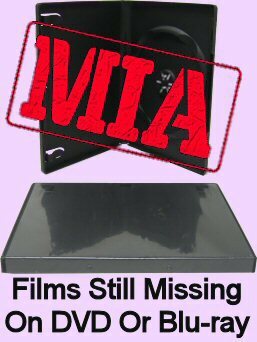 The US DVD has one real, substantial extra: an enlightening select commentary by Lars and cinematographer Anthony Dod Mantle. "Select" means that they only give an audio commentary for select portions of the film, not the entire run. But it adds up to a good sized chunk of it, and frankly I'd rather not have a longer commentary if they'd be stammering and filling the rest of the dead air with nothing really to say. It's a very good commentary, and it doesn't take the full two and a half hours to watch; great. But that and the trailer is all Lions Gate's got. It's all Nordisk's got, too... on disc 1. Yes, it's got the same commentary and trailer, and what's more, it's got a whole second DVD of terrific extras. It's got an excellent, comprehensive one-hour documentary called Dogville Confessions. A featurette titled Trier, Kidman & Cannes, which looks like it was made for Danish television, and a six minute test film Trier made before shooting Dogville. Then there are on-camera interviews with Nicole Kidman, Stellan Skarsgard, assistant director Anders Refn, producer Vibeke Windelov and two with Trier. Then there's the "Confessions," where cast and crew talk and vent to a camera that was set up in a photo booth on set. Pretty much all of the cast contribute to that. There's a short featurette on the computer effects and the technical way the film was shot and pieced together. And finally, there's footage of three press conference interviews, including one where we see Trier getting Kidman to promise in front of everyone that she would absolutely return to star in Manderlay. And if all of that wasn't enough, Trier and Mantle, along with effects supervisor Peter Hjorth, also provide audio commentary for some of the features, including the test film and the visual effects featurette. It's a hell of a comprehensive package with a ton of interesting stuff.